April 29, 2014 by Ken Ward Jr. The Supreme Court on Tuesday upheld the Environmental Protection Agency’s authority to regulate coal-plant pollution that wafts across state lines from 27 Midwestern and Appalachian states to eastern states. The regulations covering cross-state air pollution, also known as “good neighbor” rules, have pitted Rust Belt and Appalachian states like Ohio and Kentucky, which produce heavy pollution, against East Coast states including New York and Connecticut. 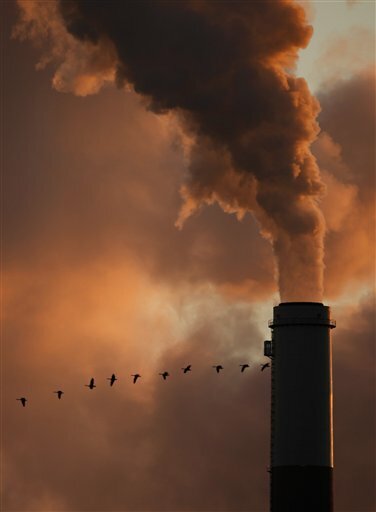 Legal experts say the Supreme Court decision, written by Justice Ruth Bader Ginsburg, may signal that the Obama administration’s other efforts to use the Clean Air Act to push through major environmental curbs on coal pollution will prove successful. In June, the E.P.A. is expected to unveil a sweeping new climate change proposal, using the authority of the Clean Air Act to rein in carbon pollution from coal plants. What will take the place of all this capacity? Stanford University scientist Mark Jacobson has developed a 50-state roadmap for transforming the United States from dependence on fossil fuels to 100 percent renewable energy by 2050. He unveiled the plan at the annual meeting of the American Association for the Advancement of Science in Chicago. Not just a victory for the EPA, this was a victory for public health in America and for the health of citizens of West Virginia. Have we so soon forgotten last winter when the power company requested that we ration our major appliance use during peek hours? With even more power plants doomed next year and 2050 over three decades away, should we shift so soon to hydro, wind and solar before they are ready to take coals place? Analysts with Sanford C. Bernstein & Co. say they expect to see “very limited impact” on the nation’s coal-burning power plants from the U.S. Supreme Court’s decision to uphold the Cross-State Air Pollution Rule, or CSAPR. In a research note April 30, the analysts suggest that power plant owners have already been retiring older and less efficient units or upgrading other units to meet requirements of the more stringent U.S. EPA’s Mercury and Air Toxics Standards and CSAPR’s predecessor, the Clean Air Interstate Rule. According to the analysts, most states are in a position to meet sulfur dioxide emissions limits set by CSAPR. Only coal-dependent Texas is likely to have SO2 emissions in excess of its CSAPR budget, they said. Similarly, they found that only Missouri’s plants would violate nitrous oxide emissions limits. Those plants would be “materially” above the state’s budget, they said. So, I guess what your saying Ken is this; Since the Power companies are already retiring all these power plants because of the regulations to deal with stringent U.S. EPA’s Mercury and Air Toxics Standards, its a mute point, this supreme court ruling? I assume it would be just a feel good “big win” then, right? The statement that 60 GW of capacity are going to be lost next year alone is not from the IER, its from the EIA. So why the IER is and what they do and don’t think seems a bit like a red herring. First, there is no way we are going to replace 60 GW in one year. For perspective, that’s the entire generating capacity of the country of Mexico. Energy analysts recognize this and have warned that this will lead to more brownouts, blackouts and many interconnects will lose nearly all of their reserve capacity. The feasibility analysis performed by Jacobson et al. (2013) is incomplete and scientiﬁcally questionable from both the technical and economic perspectives, and it implicitly assumes, without sufficient justiﬁcation, that social criterion would not produce even larger feasibility barriers. The feasibility analysis performed by Jacobson et al. (2013) is incomplete and scientiﬁcally questionable from both the technical and economic perspectives, and it implicitly assumes, without sufficient justiﬁcation, that social criterion would not produce even larger feasibility barriers. Let em guess, my comment will remain in moderation indefinitely because it completely upends your argument? Not really surprising. The EPA is the only entity willing to protect WV from itself. Hopefully the people will wisen up before its too late and elect leaders that will support clean water and clean air before it is too late. Soyedina-tol, I hope you remember your comment next time we have another winter like we did last year. Our power grid was maxed out and on the verge of a major blackout, now we are scheduled to close additional coal fired power plants, with no new additional generating cap. scheduled to come on line. What do you think will happen?